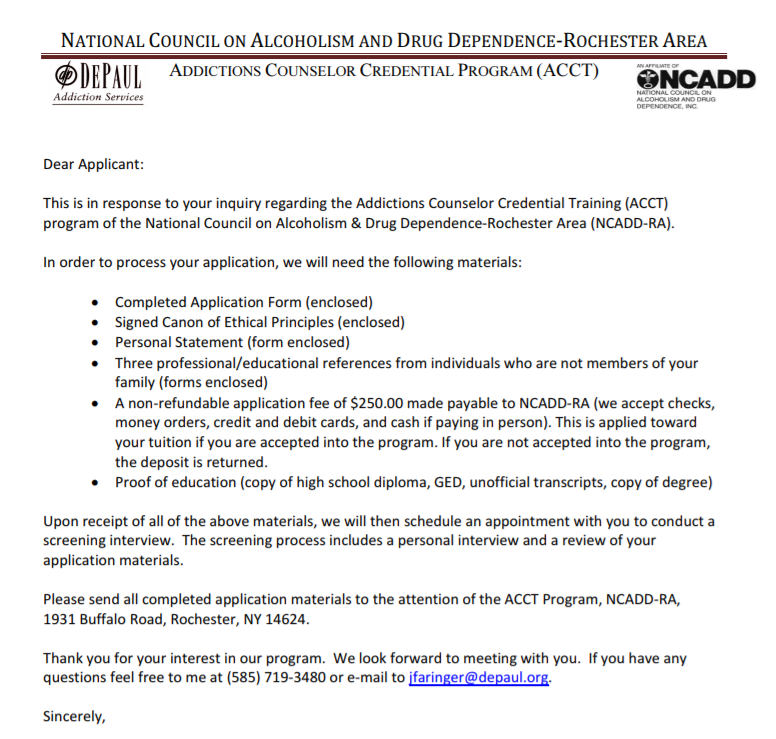 This comprehensive, 16-month Addictions Counselor Credential Training (ACCT) program trains individuals seeking the Credentialed Alcoholism and Substance Abuse Counselor (CASAC) designation from the New York State Office of Alcoholism and Substance Abuse Services (NYS OASAS). 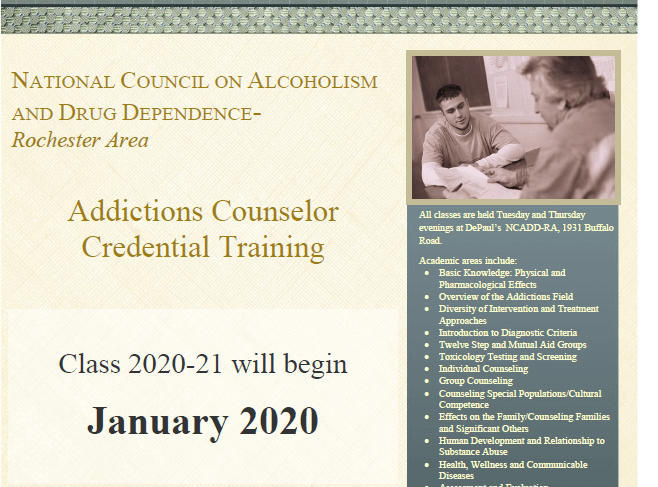 NCADD-RA provides the academic portion of the training, and also introduces students to local treatment sites for potential community internship placements. A non-refundable registration fee is due upon application. The balance of the tuition may be paid in full prior to class or a payment plan may be requested. For more information and to request a student application packet, please contact Jennifer Faringer, NCADD-RA Director, at (585) 719-3480 or jfaringer@depaul.org or Amy Johnson, Community Education Coordinator, at (585) 719-3489 or at ajohnson@depaul.org. It may be possible to earn credit toward a bachelor’s degree at SUNY Empire State College while participating in or upon completion of the ACCT program. To learn more, contact SUNY Empire State College at (585) 224-3200. 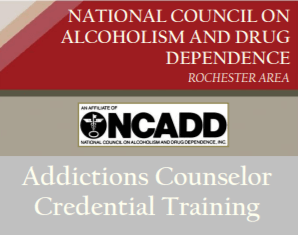 For more information on Addictions Counselor Credential Training, please contact Jennifer Faringer, NCADD-RA Director, at (585) 719-3480 or jfaringer@depaul.org or Amy Johnson, Community Education Coordinator, at (585) 719-3489 or at ajohnson@depaul.org.